Χάρη στην ποιοτική διαμονή και την άριστη εξυπηρέτηση του Elegancy Bangla Hotel, στην επίσκεψή σας σε Πουκέτ θα νιώσετε σαν στο σπίτι σας. Το ξενοδοχείο βρίσκεται 25 km από το κέντρο της πόλης και σας προσφέρει εύκολη πρόσβαση σε σημαντικά μέρη της. Με την βολική του τοποθεσία, το ξενοδοχείο προσφέρει εύκολη πρόσβαση στους προορισμούς της πόλης που πρέπει οπωσδήποτε να δείτε. Οι εγκαταστάσεις και οι υπηρεσίες που παρέχει το Elegancy Bangla Hotel διασφαλίζουν την ευχάριστη διαμονή των πελατών. Αυτό το ξενοδοχείο προσφέρει πολυάριθμες εγκαταστάσεις για να ικανοποιήσει ακόμα και τους πιο απαιτητικούς πελάτες του. Το Elegancy Bangla Hotel διαθέτει 38 δωμάτια. Όλα τους είναι διακοσμημένα με γούστο και πολλά από αυτά παρέχουν ανέσεις όπως ντουλάπα, πετσέτες, επίπεδη τηλεόραση, καναπές, καθρέφτης. ΟΙ ψυχαγωγικές δραστηριότητες του ξενοδοχείου, οι οποίες περιλαμβάνουν τις εξωτερική πισίνα, μασάζ, είναι σχεδιασμένες για να χαλαρώνετε και να ξεφεύγετε. Απολαύστε τις ασύγκριτες υπηρεσίες και μια πραγματικά περίβλεπτη διεύθυνση στο Elegancy Bangla Hotel. Κατά το check-in, απαιτείται εγγύηση ύψους 1,000 THB, για χρεώσεις ή καταστροφές κατά τη διάρκεια της διαμονής, η οποία θα επιστραφεί κατά την αναχώρηση. This is the best value you can get with the amount that you pay for per night. It's close to Bangla Street where most of the night actions are located. And it is also close to all the shopping and restaurants. If you are on a budget, this is a top choice of lodging accommodations. But be warned, as someone else has already mentioned, that since it's close to all the nightlife actions, the room is not quiet at night even if you shut all the windows. Please check with staff for guest policy when checking in. Thank you for sharing good experienced in Patong, Phuket. We are highly appreciated your staying with us. I stayed at surf hotel at the first day of my trip in phucket but they don’t really care about me. I requested late checkout but they said it’s fully booked so let me checkout early. And I changed this hotel. Looks okay, not brandnew. But their staffs in this hotel cleaners and reception staffs are so welcome and kind! Room was clean ! I will come back this hotel again! Thank you & highly appreciated for staying with us in Patong, Phuket. You are always welcome back. Let us know. Thank you & highly appreciated for staying with us in Patong, Phuket. We look forward to welcome you back soon. Thank you & highly appreciated for staying with us in Patong, Phuket. It locates in front of the Patong Beach Road where leads to the sea and has a lot of bars and clubs. The receptionist was so nice to give me detail answers when I asked. However, to have breakfast, you will need to walk about 100 meters to another Agency hotel near by. The only minus point is the room is a little small so if you have so many stuff, it’s not really enough space. For the one who likes to have backpacking tour, it’s not a bad ideal to stay there. Just come and try it yourself. Thank you. 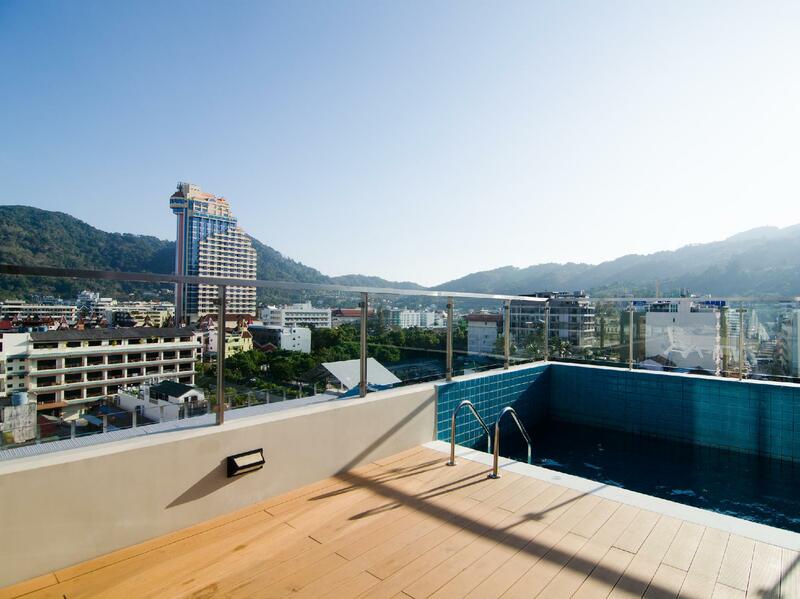 We are highly appreciated to welcome you back to Patong, Phuket. There was a dirty spot on a bed sheet, the girl at reception (Naomi) was screaming at us trying to charge 700 BTH. Worst expierence in my life, had to go to the sink and clean it my self, took only a minute. Naomi was clearly looking for easy money of us. And she was just shouting and screaming HORRIBLE!!!!!!!!!!! Noisy at night due to the restaurant downstairs. Very close to the mall and patong beach. toiletries provided except for toothbrush. Overall cleanliness was good. Would stay again if I go back there again. Hello Jacob, Thank you for staying with us and we look forward to welcome you back to Patong, Phuket soon. Make sure you could get from front desk at least two toothbrush, especially for you and friend. Have fun. i stayed in Elegancy Sansabai Bangla Hotel. its located same row with elegancy bangla. i think they are same company as i booked elegancy bangla earlier, when i checked in there, the staff presented to us another room in Sansabai. Just walking distance each other. However, we are very satisfy to stay here. The room and environement are very clean. Very good and friendly staff. The staff name is MR JO, Mr CHai are very helpful. Definitely i will stay here in future. Highly recommended!! 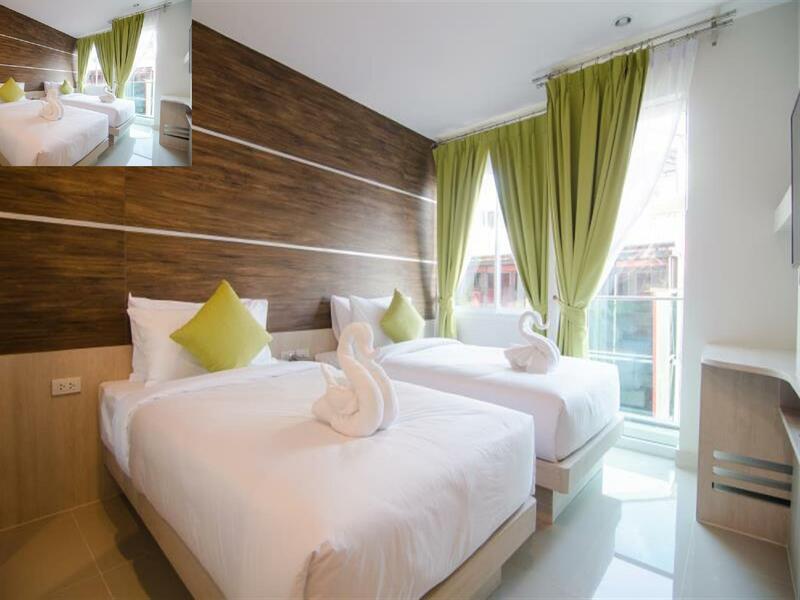 The hotel is located opposite of the famous Bangla Road at Phuket. 2 mins walk to get to Bangla Road. Surrounded by massage parlors and restaurants. There is a 7-11 2 mins walking distance from the hotel. The hotel has a small swimming pool on the top floor, can utilize it if you don't plan to spend time at the beach. It's in the epicentre of the Patong party scene, still pretty quiet in the room at night (I had a room on the south side, never tried the north side). Rooms are small but clean and nicely decorated. Great staff at the reception with good enough English skills. Small rooftop pool but clean and good temperature and also a good view over the town. Second time I've stayed here and I will stay here again if I return to Patong! 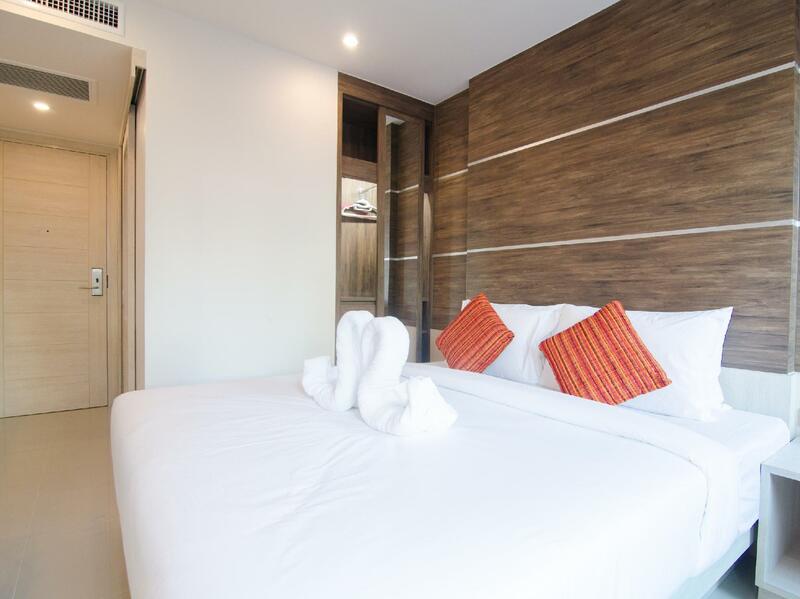 The hotel is located in the happening area of Patong. 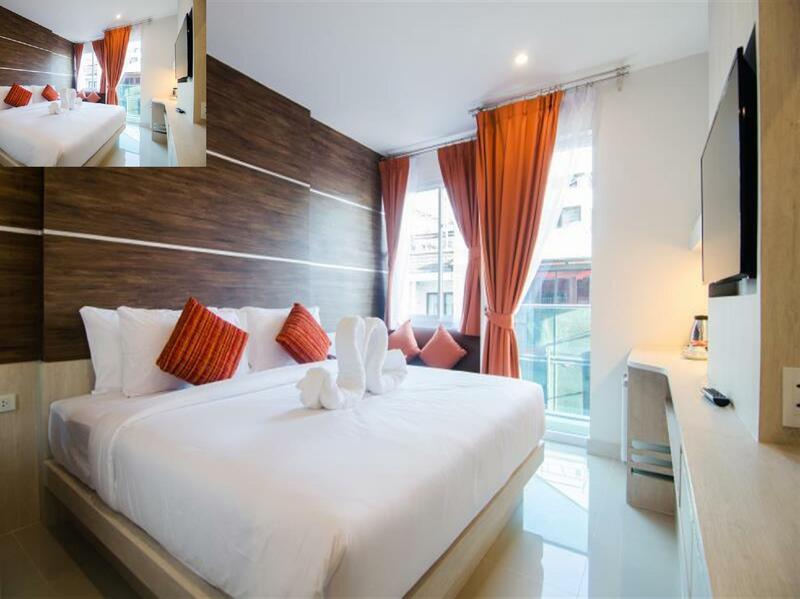 3 mins walking distance to Jungceylon Mall and Bangla Road. But the hotel is not suitable for light sleeper as you may hear noises from Bangla Road. Overall, the hotel is a good deal. We were change to the Elegancy Sansabai Hotel which is located at the same street due to the taxi driver was send us to the hotel. Actually the owner of Elegancy Bangla and the Elegancy Sansabai is same. We have a great stay at the Elegancy Sansabai. Nice location, super friendly staff which call Zoey Lucy Nuk. Thanks for her assisting. Clean and Cozy. New hotel so everything is spotless and everything works. The rain shower was wonderful with plenty of hot water and all the plumbing worked. The room was smaller than I expected but it was very nicely appointed with a very comfortable bed. The location was brilliant, less than a minute's walk from soi Bangla. The pool is tiny only 6m by 3m so you can't really swim in it but the surrounding decking and view is lovely. Definitely stay here again.